Is Mozilla's Firefox 5 a More Stable Browser Than Its Predecessor? A quick look at the features and improvements in Firefox 5 however reveals what the Mozilla foundation did to accomplish the fast release: There are some significant upgrades under the hood, but this is really more of a 4.1 release than a full new version of the browser. However, the big news is that the release of Firefox 5 may finally solve the stability issues users have complained about since the beta builds of Firefox 4. When the Mozilla foundation released the last major overhaul of Firefox back in March, it was a huge step forward for the browser. The update brought with it a host of new features like improved tab navigation and the ability to sync bookmarks across multiple computers. Perhaps most importantly, Firefox 4 improved the speed of the browser which had been lagging in recent years. However, Firefox 4 also brought a lot of complaints about random crashes. A user named bigdaddyken on Mozilla's support forums posted that "firefox 4 crashes constantly, on opening, different pages, etc. Old firefox worked fine." More than one thousand users reported the same issue, and this report was only one of many crash complaints on the forums. PCWorld users have also had problems with the browser. In a comment on our early hands-on with Firefox 4 report, user xvMATTLEEvx said "Sure it has added features but that is just to keep up with everyone else it's nothing innovative like Mozilla used to be. On top of that Firefox 4.0 is suffering the same crashes and memory spikes Firefox 2.0 suffered. I am talking without add-ons not with add-ons." The list of Firefox 5's new features isn't exactly designed to thrill. It's headed by "added support for CSS animations" and features other improvements like "improved discoverability of the Do-Not-Track privacy feature preference" and "improved spell checking for some locales." Clearly the features listed here aren't the real news in Firefox 5. Users will probably be a lot more excited by the list of hundreds of bug fixes that come along with Firefox 5. 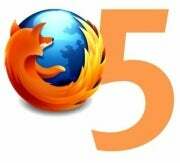 While there is some reason to worry that this rapid update strategy brings as many problems with it as it solves, with any luck, these bug fixes will make Firefox 5 as crash-proof as it is fast. Today, we asked our Facebook page users if they had any similar problems with Firefox 4 and quickly got more than 40 responses like Irving Cool who says "FF4 crashes a lot :S" or Wali Khan who stated his "New Firefox crashes every 5 minutes." Let's hope Firefox 5 really solves the problems. Do you experience problems when using Firefox 4? Have you downloaded Firefox 5? If so, how is the new upgrade treating you? Let us know in the Comments.